By the Strangest coincidence, I found that Memsaab and I had been watching Apraadh almost at the same time, and it was a wonderful chance to post about it simultaneously! 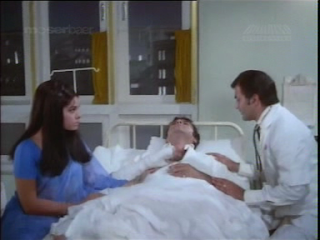 Cast: Feroz Khan, Mumtaz, Prem Chopra, Iftekhar. 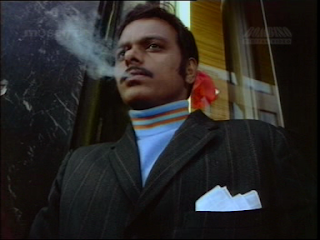 ... she is part of a gang of thieves, one of whom is serving as a watch-dog - dig the sweater folks- all the supporting actors in this movie are fabulous, and he is only the first one we meet. Rita steals a priceless necklace and runs for the border, in a gorgeous golden jacket- you have to wear camouflage when you run from the police you know (head nodding wisely). While Rita is off with the necklace, her boss is waiting with his gang in his den. You HAVE to love his moll, Faryal- I adore this woman- so vampy, such fabulous eye makeup- I covet it! ... gosh they are just gorgeous! The chemistry between them is great, and they seem at perfect ease with each other- their friendship is pretty obvious here. ... because Ram and Meena are leaving Europe to go back to India. Ram has a brother there, and they plan to live happily ever after. ... but not all plans go smoothly. 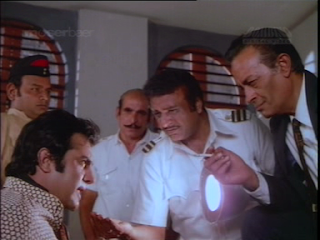 Iftekhar and his police team catches Ram before he leaves the airport and he is accused of smuggling. 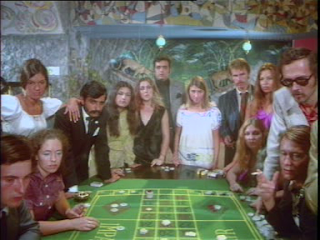 Turns out his brother Harman (Prem Chopra) is a smuggler, and has a red den of his own, with music by a guy in a sombrero and dancing blondes lead by a white spangled swim-suit wearing Helen! 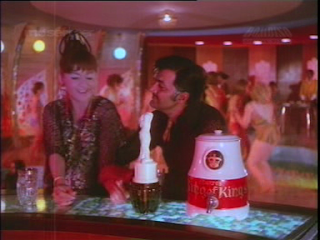 Prem's den is really cool- that white statue's base holds alcohol, so that when you tip the statue, it pours your drink! Ram doesn't stay a word about his brother, and despite being innocent, spends jail time. 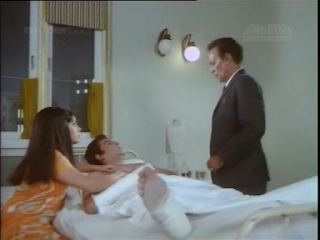 He comes out and decides to work in a factory, and Mumtaz and he again show some amazing chemistry. 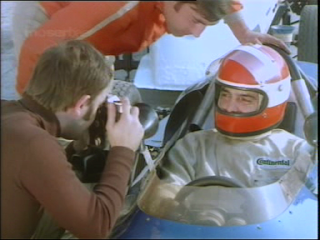 I don't understand why he doesn't do race car driving again- more money in there, no? The goons have a worse plan though. 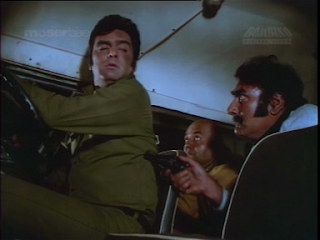 Unknown to Harman, they decide to kidnap Ram and make him help them in a heist at his factory. .. and Helen tries to entice Ram with the power of her blue eyeshadow and orange braids. So will Ram get used to the alcohol-spewing statue? Will he forget Meena by the power of Helen's Halloween colors? Will Harman and Ram live happily smuggling ever after? 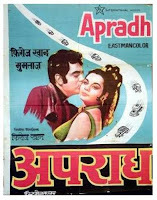 Watch Apradh already to know! 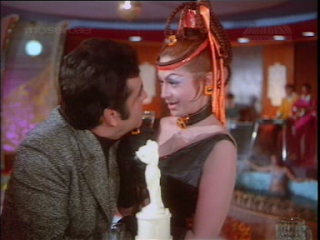 1- Prem Chopra did a really great job, and this role was different from the majority of negative roles he has done. I liked how he really loved his brother and tried to protect him, in his own way. 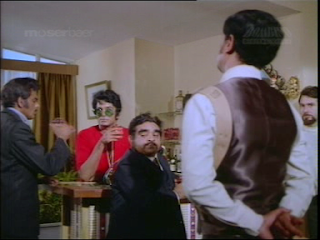 2- Every supporting actor was brilliant- on the top of my list are Faryal, the guy in the glasses (what IS his name?) and the sombrero man. 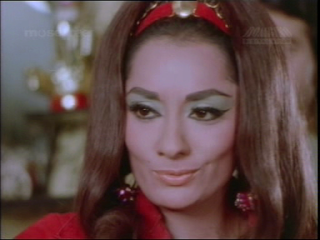 3- Mumtaz' fashions in the first half are so fun- I'd have liked to see more of them. I have three copies of this film, and only got subs on the third try (the Eros version). It's worth buying (Nehaflix has it right now, although it's often out of stock)...so forget Netflix, go straight to the shopping cart! So Shweta: where do we begin? 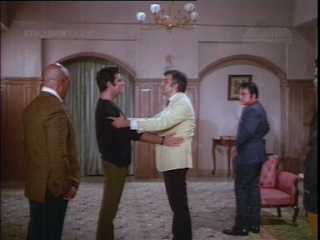 I too loved Feroz and Mumtaz' meeting, esp. when he thought she was European and called her an ulloo in Hindi. They had such great chemistry. And Prem C. was great in this, I loved that he had a more nuanced character than usual. I don't always appreciate him, but I did in this completely. Well, plus I want that nightclub. MUST HAVE IT. Esp. if it comes with Helen and Sombrero Man, the new object of my OCD! Thanks for the lovely screen caps. Had me rolling with laughter on some of them. 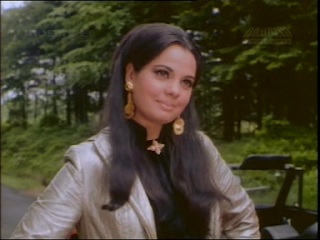 Mumtaz looks so gorgeous. Gotta go get this for her! Like sita-ji, I have to find a copy with subtitles. Nicki: Mumtaz is so great! 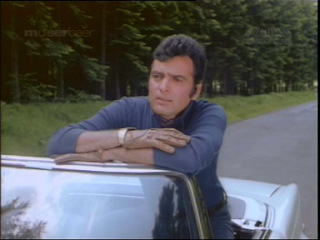 Her Eros and my Moserbaer copies both have subtitles. Although Bhushan Tiwari is on the cast list. So it could be him...sigh. 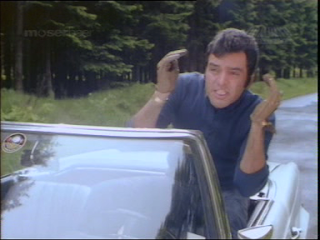 and the other Feroz-directed (and produced) films I've seen I also loved: Dharmatma and Qurbani. Will need to see more of them too!!! I saw Dharmatma too long ago- obviously must see again. I think I am going to try googling all the unitentified actors listed on the cast list- may help resolve the Ranjeet issue. Is this the film with the song 'Aye Naujawaan, Hai Sab Kuch Yahaan'? You are absolutely right on the song! Yeah I seem to have posted quite a bit this month- it was all the new movies that came out- whut to do.